Repairing drywall professionally is not as difficult as you might think. The first time I tried it, I actually used drywall repair to patch a latham plaster wall (FYI - you can't fix latham plaster with drywall!) so it didn't turn out so well, but I got some good practice on how to use drywall and drywall mud. So the next time I did this type of home improvement project, I did it on an existing drywall wall and did a great job! The steps for this home improvement project are relatively easy. The best way I've found to do drywall repairs is with a "hat patch." The first thing you need to do is make the hole a clean cut, whether it be a circle or a square, it doesn't really matter. Then, very carefully, cut partway through the drywall (also known as gypsum board) along the true hole measurements and fold it over until it's only attached by the paper on one side. Gently peel the gypsum off of the paper to leave the paper attached to the inner cutout shape that will fit in the hole. Do this all the way around the cut out shape. 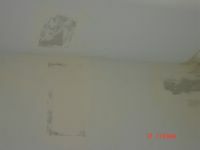 Then you'll want to put some mud on the wall where the paper back will be placed, just a thin layer will do. Press the cutout shape into the hole leaving the paper to grab the wall and press firmly so it grabs the mud. Then you will want to spread some mud around the edges of the patch and smooth it out until the line of the patch disappears. Wait until it dries and sand lightly to smooth it out. Apply more mud if neccessary and repeat. Once completely dry and sanded, paint the area and you're finished with your first drywall repair project!